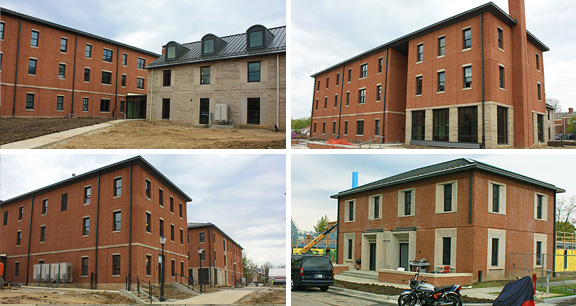 Project obstacles and solutions: Wabash College announced in 2014 that it was constructing six new student housing buildings on its Crawfordsville campus. The new Residential Life District included two residential halls, two lodges and two duplex style townhomes. The six buildings would house a total of 132 students. Each unit would offer unique housing configurations to give students a variety in residential living. In total, the six buildings covered nearly 95,000 square feet. Hagerman Construction was selected as the general contractor for the project. Since these units were built on a college campus, it was critical for them to be completed in time for students to move into them at the beginning of the semester. The front two townhomes were completed in August 2015 and were occupied for the first semester. The four larger buildings are to be completed by the summer of 2016, in time for fall semester occupancy. IMI supplied concrete for footings, walls and floors throughout all of the units. They also supplied the concrete for the stoops and walkways. Key to pouring the internal slabs was the use of high-range water reducers in the mix. A number of the concrete floors were specified to be polished and used as finished floors. The concrete for these floors was poured with a super plasticizer to reduce the water-to-cement ratio. As bleed water exits curing concrete, it creates pores. Reducing the water content tightens the concrete and makes a smoother finished surface. The use of fly ash in the mix was also an important part of the finished floors. Fly ash is a pozzolan that takes the place of Portland cement. It produces a creamy surface that works well in polished floors. For more information on concrete for polished floors, contact the sales representative at the concrete plant nearest your location. Click here.